Ensemble movies are often a mixed bag because they’re more focused on bringing together known and/or famous actors together rather than a cohesive story created to force the characters to have any sort of connection so the audience will in the end go, “Ah!” Admittedly, as much as I have enjoyed Playing by Heart over the years, the connective tissue writer/director Willard Carroll puts forth does become a tad much, as are a cliché or two… The film’s saving grace is a solid cast, however. There are several almost vignettes to Playing by Heart all brought together in the end, but I will leave that to anyone who hasn’t seen the movie yet. Joan (ANGELINA JOLIE) is a young, strong woman who loves the night life and clubbing and meets quiet, sensitive Keenan (RYAN PHILLIPPE) who is reluctant to become involved with Joan due to something in his past; Meredith (GILLIAN ANDERSON) is a theatre director scorned by men in the past so she tries to resist the charms and pursuit of Trent (JON STEWART); Hugh (DENNIS QUIAD) is a new acting student stuck in a lifeless marriage with his wife, Gracie (MADELEINE STOWE) who is having an affair with priest Roger (ANTHONY EDWARDS); Mildred (ELLEN BURSTYN) is a loving mother at the hospital bedside of her gay son, Mark (JAY MOHR), dying of AIDS; and last are Paul (SEAN CONNERY) and Hannah (GENA ROWLANDS) who have been married for many years and plan on renewing their vows but face their biggest challenge when he confesses to having an affair years earlier. The characters all have one thing, or people, in common but as I said, I’ll save that for the viewer. First, I will admit where the film does falter somewhat is with the Mildred/Mark storyline. While both Burstyn and Mohr give brave performances, it’s also a tad clichéd since I assume the man dying of AIDS story was in vogue in the mid to late 90s thanks in part to Tom Hanks’ Oscar-winning performance in 1993’s Philadelphia. Of course you can also exchange AIDS with another disease, so long as you have a character dying to pull at the audiences’ heartstrings. Another story thread which doesn’t exactly ring true is that between Gracie and Roger, not because Roger is a priest but compared with the others, it came across weak in the acting arena. The film, though, excels thanks in large part to a fun but emotional performance from a then relatively unknown Angelina Jolie. At the time, Jolie had been a several films but she still was under the radar appearing in various films such as Cyborg 2, Hackers, Foxfire and Playing God before finding stardom with 1999’s Girl, Interrupted for which she won an Academy Award as well as The Bone Collector alongside Denzel Washington. Her story with Ryan Phillippe, who probably gives one of his better performances alongside Cruel Intentions, is perhaps the most interesting of the bunch and best acted as well. The other storylines are well acted though my second favorite would have to be Meredith and Trent mainly because when I saw this I was still into “The X-Files” so seeing Gillian Anderson outside of her Scully character was fun to see combined with seeing Stewart in a feature film versus on his “Daily Show” (prior to Playing by Heart he also appeared in The Faculty). Obviously “The Daily Show” came about years later, but from the prism of time, it’s interesting to see (just like how Greg Kinnear began as a late night show host before moving onto acting). Playing by Heart isn’t a great film but one that I can watch again and again throughout the years, not unlike You’ve Got Mail, two films that are nowhere near perfect yet thanks to the chemistry with the characters, you have a good time. If you still haven’t seen it, give it a shot either on DVD or on cable where I tend to see it on the grid every so often. No surprise, but there’s nary a feature on this release. For fans of this film, I have some good news and I have some bad news. The good news that we finally have an anamorphic transfer (1.85 AR as best I can tell) – one which is off center on the left, but not unusual – but the bad news is there is heavy interlacing throughout so much that you will notice by merely pausing at any point in the film (the last scene especially is noticeable). 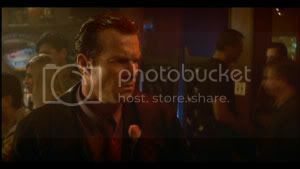 So, I am torn on this because it is nice to get an anamorphic transfer but the interlacing is pretty bad. For whatever reason, the Echo Bridge releases of old Miramax films receive minimal treatment and even a downgrade in the audio department. The Buena Vista DVD release had a Dolby Digital 5.1 track while this one receives only 2 channels. 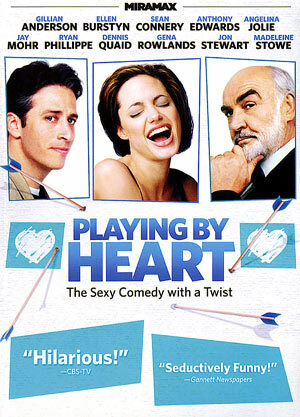 That said, since Playing by Heart is mainly a dialogue driven movie, it’s not too distracting. Overall, I enjoy Playing by Heart for what it is, a fun, if not overly dramatic, ensemble with some good performances as well as clichéd storytelling, especially in one of the storylines. As far as this DVD goes, it’s a mixed bag as to whether or not it’s worth getting if you already own the original release. This one does have a proper anamorphic transfer though it is heavily interlaced and the framing itself is a bit off. It is, however, better than having to use your zoom feature with the other DVD and with the cheap SRP, one should be able to pick this up for less than $5.